Los Angeles (AP) – Lanky and long-haired, with mutton chops and moles, Ian “Lemmy” Kilmister looked and lived like a hard-rock hero. He founded Motorhead in 1975, and continued recording and touring with the band until his death. The singer and bassist died Dec. 28, at age 70 after a brief battle with aggressive cancer, said his agent Andrew Goodfriend. He had learned of the diagnosis just two days earlier, according to a statement from the band. Kilmister had suffered numerous health issues in recent months. 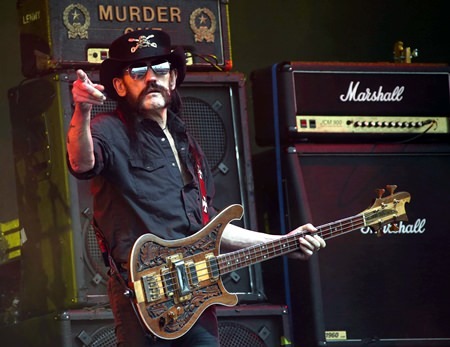 Born on Christmas Eve, 1945, in Staffordshire, England, Kilmister was deeply respected and revered as a rock master and innovator, from his time with the seminal psychedelic band Hawkwind in the early 1970s to his four decades in Motorhead, best known for the 1980 anthem “Ace of Spades.” The band won a Grammy for 2004’s best metal performance.